As a full time working mum, its hard to find time too cook meals freashly each evening for us to eat as a family as soon after we get home its bed time. I enjoy spending as much time as possibly with Jack and don't like this to be shortened by spending a lot of time over the cooker. Don't get me wrong, we still eat and enjoy lots of fresh meals, however we just do the preperation at an earlier stage and freeze. Appliance House have joined up with an ex Waitrose food editor who shares five fab recipes which are all suitable for home freezing. 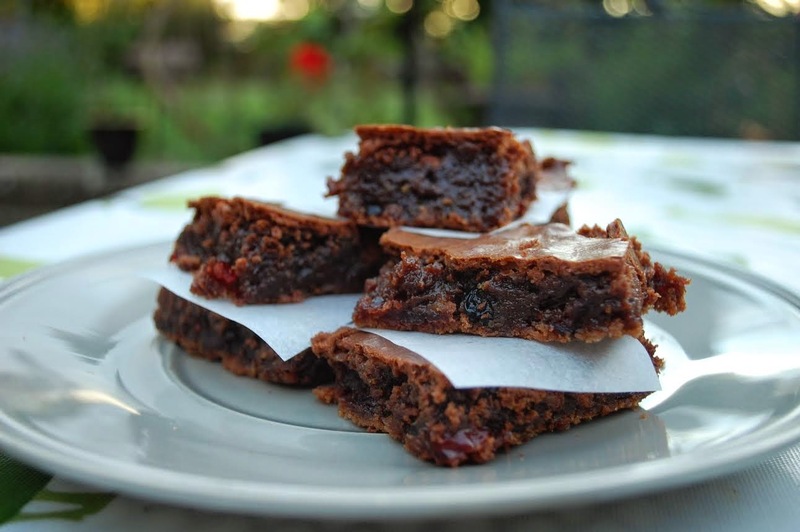 One of these is Chocolate and Cherry Brownies. Who doesn't like brownies? These have a crisp crust and a delicious gooey centre, best served warm with vanilla ice cream. If you've frozen them previously then just warm them briefly in a hot oven. 1. Preheat the oven to 180o, gas mark 4. Line a small roasting tin with baking parchment. 2. Place the butter and chocolate in a heatproof bowl and allow the ingredients to melt either over a pan of barely simmering water or in a microwave on a low heat. Allow to cool slightly. 3. Place the remaining ingredients in a mixing bowl and pour in the melted chocolate and butter mixture. Fold together lightly until throughly combined. Pour into the prepared tin and place in the preheated oven for 25-30 minutes until a crust forms. Remove from the over and allow to stand for 15-20 minutes. Cut into squares when cooled. Add alternative ingredients to the cherries according to what you have in your cupboard. Pecans and brazil nuts work well instead of cherries, or leave out as you prefer. To freeze them wrap first in cling film and then in foil and freeze for up to 3 months. The lovely people at Appliance House have offered readers of my blog the opportunity to win a Electrolux Rapido Wet and Dry Rechargeable Handheld Vacuum Cleaner. Rechargeable and cordless, the Rapdio is a high performance cleaner with low noise levels suitable for wet or dry spills at home or in the car. Sometimes! I often freeze homemade chilli or soup! Yes, I bulk cook burritos and freeze them. I always freeze lasagne and chilli because they're great to batch cook and easy to reheat. No I don't, I tend to freeze things like mash if there's a lot left over but otherwise not. Maybe I should! Not often, but if I do, it's soup! We spend rainy days in winter cooking up huge batches of chilli con quorn and fill the freezer! Then we take out a bit at a time to keep us supplied with fab quick hot comfort food for when we get home from big days out walking in the hills! Not very often. Chilli would be the best. I always make a bulk lot of bolognaise and freeze some, ready for spag bol. I cook meals in the slow cooker such as stews and casseroles and then freeze them. I usually try to make double of everthing and freeze half whenever possibleI We have 2 freezers and I do like to keep them both filled to the brim! I tend to freeze and reheat quiches - they are great for using up our three chickens' eggs! Lasagne as it always reheats so well and feels like such a massive meal. Yes. Chilli is my favourite. i dont usually freeze meals as meals arent around for long enough in house!! i don't really freeze meals. i'll sometimes do a lasagne and freeze it but that would be the extent, i think! I don't tend to freeze meals, but do freeze sauces. i freeze lots of things but my favourite thing to freeze and reheat is gravy from a beef joint. I make loads so I can then use it with pie or toad in the hole in the week. I always try to make one lot to eat and one lot to freeze when I cook so I freeze curries, Veggie stews, Soups and Quorn Lasagne and Bolognese. I love the idea of just taking it out of the freezer and not having to cook! I love making up large batches of pasta sauce and then freezing some - makes a very quick meal. Yes I freeze all the time. My favourite has to be lasagne. Macaroni cheese - but generally everything gets eaten quickly with 9 kids around and I don't get time to freeze it first!